Allie had an appointment with her endocrinologist at the Marshfield Clinic last week. Her appointment was a follow-up to monitor her growth. 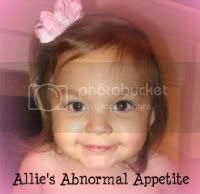 Allie weighed 26 pounds and is 37 inches tall. This puts Allie in less than the 3rd percentile for both height and weight. Of course, this is nothing new, however her stats are falling once again on the growth chart. Her curve is going downwards and the doctor is very concerned. Allie's growth rate last year was 8.2% which is acceptable, however this year her growth rate has dropped to 4.8%. That is too low according to her doctor. 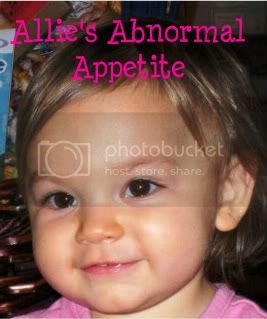 We are scheduled to meet with her Endocrinologist again in December and if Allie's growth rate does not increase in the next 4 months, they want to start Allie on growth hormones, which is an injection everyday. We have been tossing the idea of growth hormones around for her for quite a while. We just didn't feel like it was right for her at the time. However, depending on her next visit, the doctor is really going to push it. Of course, we haven't decided if growth hormones would be right for Allie - we will make that decision when we have to. In the meantime, we are trying to increase Allie's tube feedings, but continue to struggle with the fact that Allie's stomach is super small (cannot handle more than 3 oz) and the fact that her stomach doesn't empty properly. So, it's always a struggle to get enough calories into this girl. On another note......Allie's behavior has been difficult again, a lot of whining, crying and not sleeping. So, I decided to bring her to the walk in because I knew something wasn't right with her. Sure enough, Allie has strep throat. Poor little pumpkin. I had been asking her if anything hurt and even asked her specifically if her throat hurt but she always said no. One more example of how little Allie has such a high tolerance for pain. She is now on her medication and we are praying it helps her feel better so in turn her behavior goes back to being happy. Overall, Allie is doing well. She is ready for preschool to start and so is mom! Please pray that Allie's growth rate increases in the next 4 months so we don't have to cross the bridge regarding growth hormones for little Allie. Thank you.